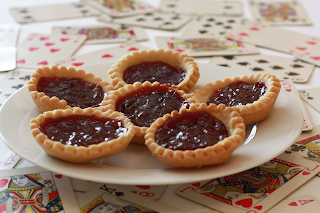 Jam Tarts are the first cakes I can remember my Mum baking for the family when I was a child. 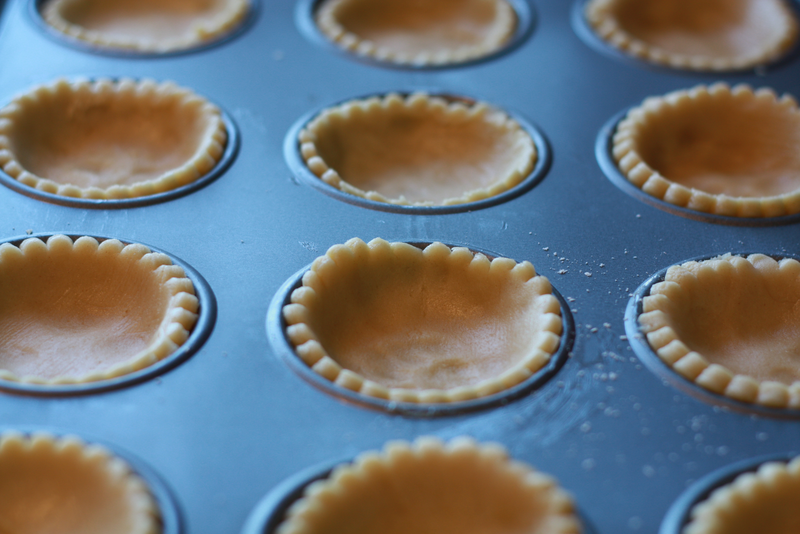 If using shop bought pastry these would be quick and simple to make for and/or with the kids. For me, this was an opportunity to relive a childhood memory, whilst using a simple recipe to practice shortcust pastry. For tips and pictures on shortcrust look here. Food processor (or mixing bowl and sieve), clingfilm, rolling pin, 12-hole bun tray, 78mm cutter round fluted cutter (of if you don't have cutters, try your glassware. I found a mug was roughly the right size), cooling rack (or the rack from your grill). You will want to use chilled butter so get that in the fridge the night before. You need iced water, so get a glass of water with an ice cube in it, stood in the fridge a short while before you get started. 8-12 tablespoons of thick set jam (avoid runny conserves). 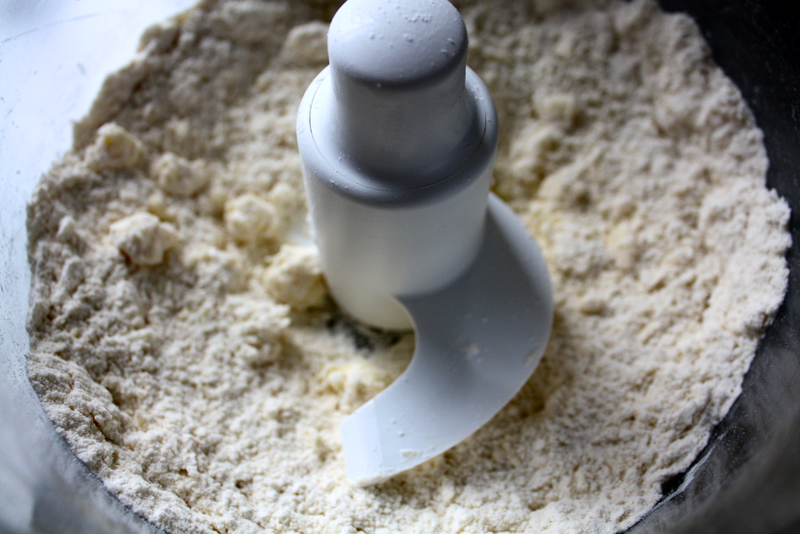 Weigh the flour straight in to the main bowl of the food processor. Add the sugar and salt. Using the standard blade, pulse briefly to mix. 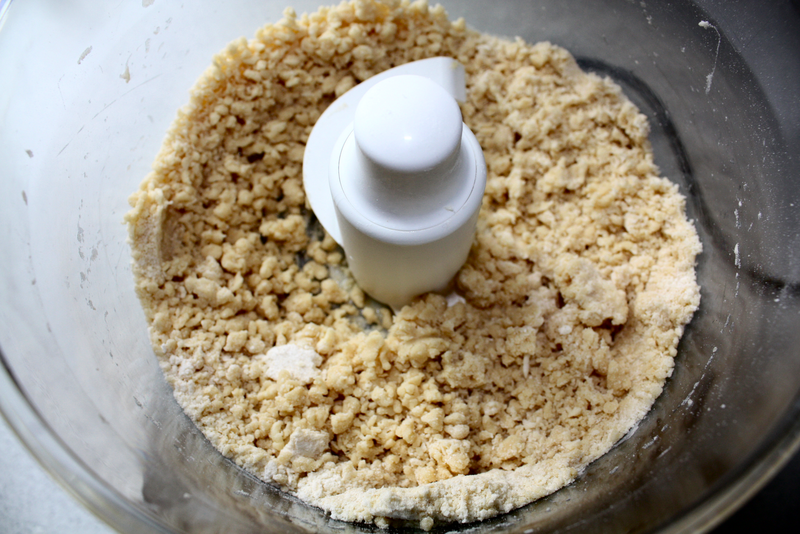 Add the butter and pulse a little longer until the mix is like fine crumbs. 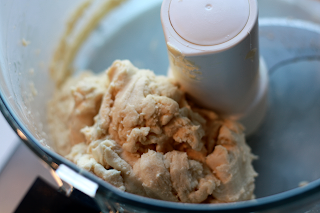 If not using a processor, sift the dry ingredients into a mixing bowl, before rubbing in the butter by hand. Add 2 tablespoons of iced water and mix further. 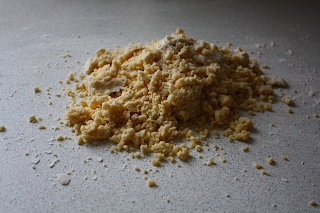 The crumbs should quickly form a dough. Tip the dough onto clingfilm. You should easily clean the bowl with any crumbs joining the dough. If the pastry is too dry, carefully add more iced water. Wrap the dough in the clingfilm and flatten the ball to increase the surface area. Put this in the fridge for at least 20 minutes. You can use this time to wash up and lightly grease the bun tin with butter. Set the oven to 180°C / 350°F / Gas mark 4. Either on a lightly floured surface with a floured rolling pin, or between two sheets of clingfilm, roll out the pastry to a 5mm thickness. Flour the cutter and then cut circles of pastry and gently press into the bun tin. Gather the trimmings, and repeat until you have 12 pastry shells. 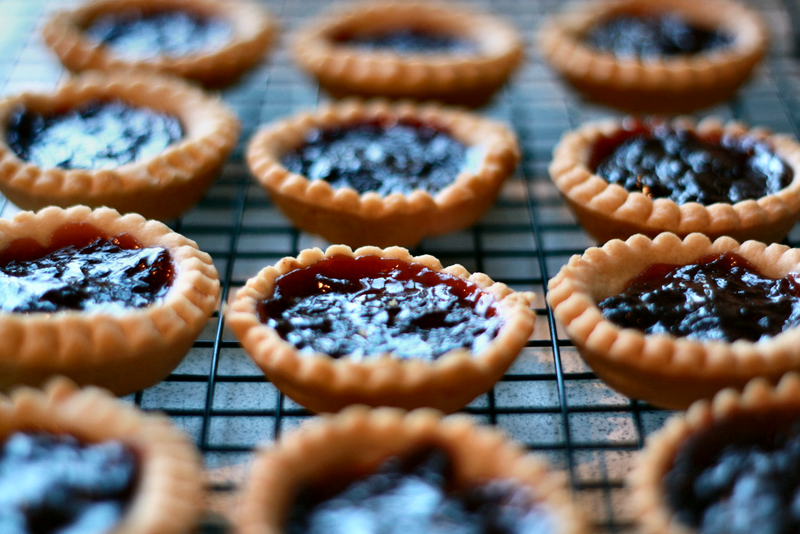 Place a generous blob of jam in the middle of each tart. During baking the jam will become molten and level out. If you can visualise this you'll know what looks right. Bake for 20 minutes during which the pastry will turn a light golden brown. Remove from the oven and leave to cool for 5 minutes and then transfer to a cooling rack. 166 kcal, 7.8g fat, 4.3g saturated fat, 17g carbohydrates, 0.2g fibre, 4.3g sugars, 1.1g protein. 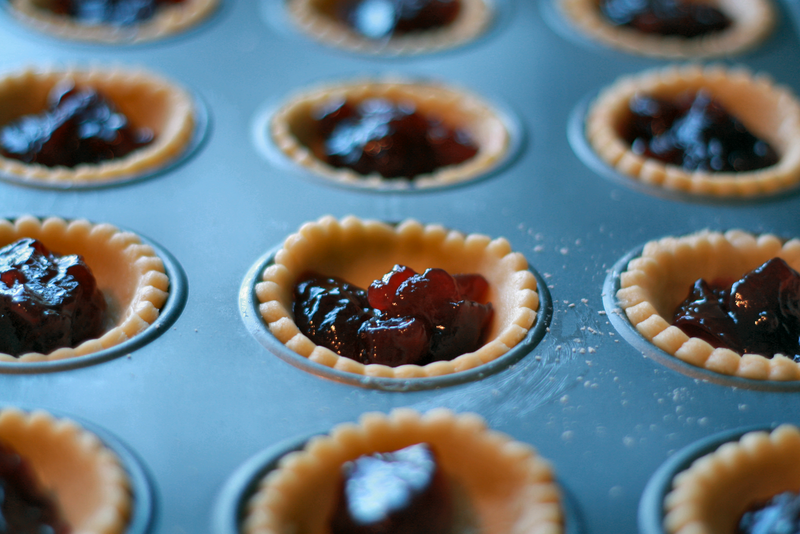 Shortcrust is supposed to be the easiest pastry to make. I've made it a few times myself now so I'll share with you what I've learned. Made from Plain Flour and Butter, the texture should be quite crumbly and bake to a light golden brown. Salt, water, and sometimes egg is added to bind it all together. 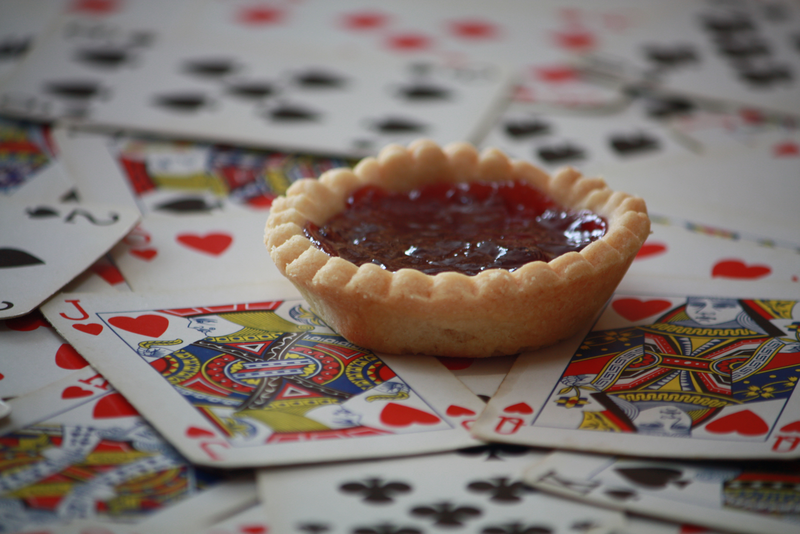 The salt can be replaced with caster or icing sugar if the pasty is to be used in a sweet dish. A basic starting point is 2 parts flour for every 1 part of butter. 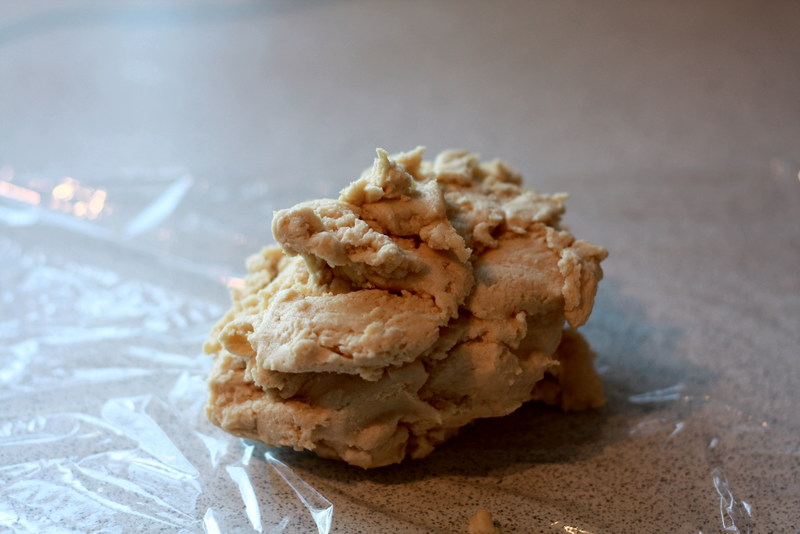 If you are new to baking, and have yet to invest in a food processor, you can easily make this pastry by hand. Because the warmth of your hands will warm the ingredients you should make sure to keep to the chilling times. Food processor (or mixing bowl and sieve), clingfilm, rolling pin. Weigh the flour straight in to the main bowl of the food processor. There is no need to sift the flour. Add the salt. I recommend using the standard blade. Using the dough blade as in some of these photos doesn't get close enough to the edges. Pulse for a couple of seconds to mix. Add the butter and pulse a little longer until the mix is like fine crumbs. Sift the dry ingredients into a mixing bowl, before rubbing in the butter by hand. 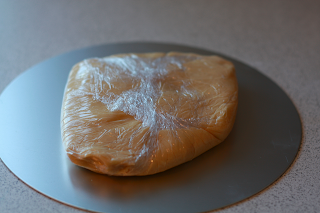 Wrap the dough in the clingfilm and flatten the ball to increase the surface area. I sit this on the metal base of a baking tin to further help heat transfer. Put this in the fridge for at least 20 minutes. When I heard there was a contestant from the BBC 'Great British Bake Off' program, selling puddings locally, I simply had to visit. It took me a while to realise that Johnny is a mobile business and doesn't have a shop. Indeed, his travels and my misguided attempts to find him have lead to me dubbing him "Doctor Who of the pudding world". Of course when you track down the Tardis, a fine selection of traditional puddings and treats are served up to tempt your taste buds. You should check out The Pudding Stop now to plan your visit. Johnny's Bakewell Tart is generous in size. Being sweet toothed I can easily devour this delicious pudding as a snack. Others may may want to save this for dessert, or even cut it in half. The pastry is nicely baked, firm, and subtly sweet. It resisted my manhandling whilst arranging the photo and will not let you down if you can't wait to get it home and choose to eat it on the go. 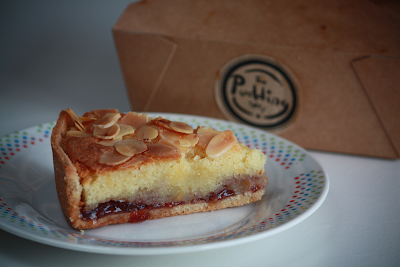 The almond sponge is moist and consistent throughout and complemented in texture by a scattering of flaked almonds. A liberal layer of strawberry jam coats the base. Its slightly thicker at the edge of the tart and does well to keep the side-wall pasty from drying the mouth. If it was engineered this way, then it is genius, and certainly a good tip I'll try to remember in my own bakes. It was the eye catching tin that first attracted me to these beauties on my local supermarket shelf. Now without further delay I give you my first product review on this site. These biscuits are visually inviting. Whilst being of similar size they aren't perfectly round, nor flat on top. Rather they have a rustic, uneven surface revealing flecks of crystallised ginger adding to their appeal. The bronzed treats are firm but soft. You won't break your teeth. If you break these in half they flex a little first before snapping confidently. In the mouth the biscuit is light. You feel the rough texture of the oats and the chewy crystallised ginger pieces. All too easily you can find yourself using your tongue to pick a errant crumb from your teeth. 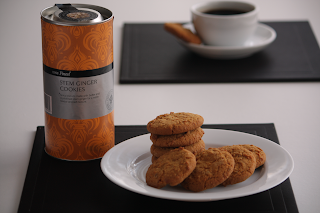 stem ginger for a warm flavour and soft texture. The taste of ginger is strong enough to be noticed, but not overpowering. You can chomp through three or four biscuits with no unwelcome aftertaste or any need to take a drink. 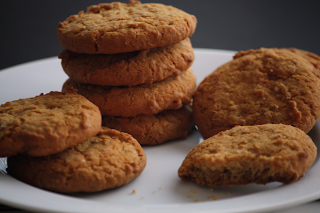 These subtle qualities make these cookies all very moreish. Described as "All butter ginger cookies" you might expect them to seem very rich. However I do not find this the case. I calculated each biscuit to have 77.5kcal of energy and 1.9g saturated fat. These appear no worse than a digestive or a Hobnob. I paid £1.15 for a tube of nine. At 13p a biscuit, in my opinion, they are worth it and I would buy them again. I suggest you seek them out.